Boards are made up of multiple layers that cross at 90 degrees, glued and pressed together. The hardwood top layer is bonded to the inner core which is made up of soft wood strips usually spruce and incorporate the tongue and groove system. The bottom layer is a thin softwood veneer with the grain running the same way as the top layer. This structural make-up allows our Black Forest Collection to fitted as floated floors laid on specialist underlays in most situations including over underfloor heating. Depending on where you live, delivery of this Oak Rustic Brushed & Oiled (HHA104) Flooring will be made by either our in house delivery team or our one of our specialist couriers. You will be advised which method is being used when we arrange delivery. 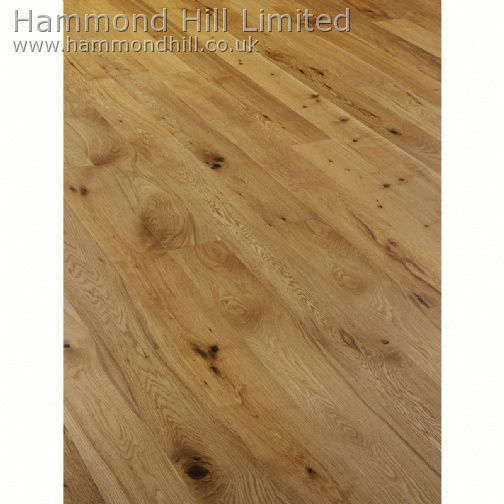 We will do our best to ensure that your Oak Rustic Brushed & Oiled (HHA104) Flooring is delivered on the date agreed. There are times however when this is simply not possible due to unforeseen obstacles encountered by our drivers, whilst attempting to deliver the order. If the customer is not available when we attempt delivery we will return the goods to our warehouse and a new delivery date will need to be arranged.